We have communication problems in the medical world. No, not just the lack of communication happening between healthcare providers that some mistakenly think the newly christened “EHRs” are going to fix. More importantly, the disconnect lies between the data and those reading it. Providers sift through a patient’s chart gathering data to develop a mental snapshot of where the patient is medically-speaking, at currently. Dr. Deborah Rhodes recently mentioned in her TEDTalk that there is a debate as to whether or not women should be notified of their breast density (a very important factor in determining effectiveness of mammograms) by their physician. It’s not just mammogram results either. Providers are leery of releasing test results electronically through a patient portal because they don’t think their patients will be able to properly interpret them. “This medical information is highly technical and complicated stuff! We have advanced degrees specifically so we can tell you what you need to know and you’ll never be able to figure this out on your own!” Of course, they are mostly right. It really is highly technical and complicated stuff. The problem is that we present the information out of context with maybe some reference ranges and then we have to have someone provide context. If you presented raw meterological data in the newspaper no one but a meterologist would have an inkling as to what the weather was going to be like that day (insert joke about meterologists’ accuracy here). In fact, for those few readers that would even look at the data, they might pick out one of the temperatures for the day and be able to determine if that was the high or the low and then give up on what the rest of the data was there to tell them. However, meterologists figured out a long time ago that you can come up with informative graphics that give people a quick snapshot of what their day will probably be like weather-wise. Most importantly, we take action from the quick snapshot that we see. 60% chance of rain in the afternoon? I’ll take an umbrella just in case. 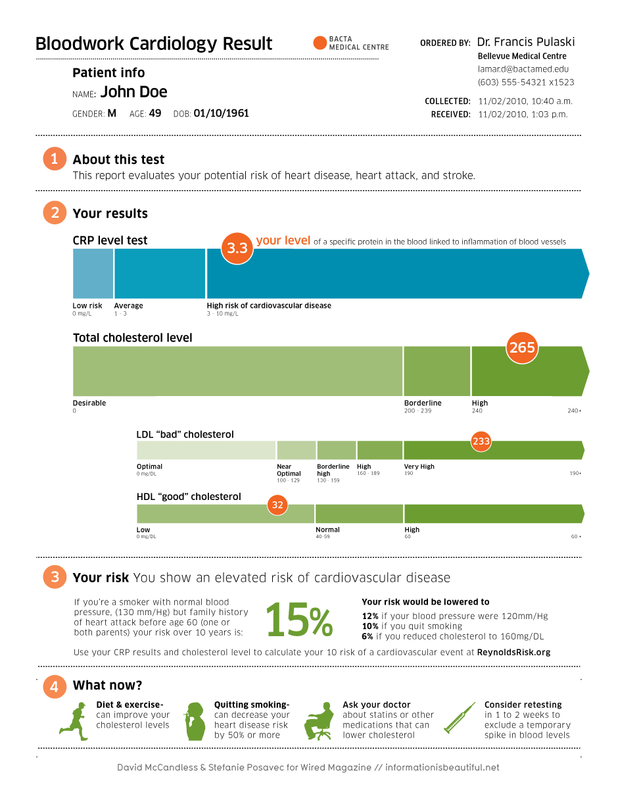 My lab results say I have a cholesterol level of 265*. I see that’s high given these reference ranges, but I don’t know if I can take action and change that or what actions to take. Which means I probably won’t. Or what if a provider could digest and analyze the following information from a single second of chart review: I see this patient has been noncompliant in following their treatment plan. Perhaps I should refer them over to this problem-specific program that’s showing an 85% success rate for treatment. With concern to communicating data to patients, most of the costly diseases today are relating to lifestyle choices. Do we want to hand them data out of context or tell them that should probably bring an umbrella today? Some great examples of what we could do for patients are coming out. For instance, check out this redesigned Cardio CRP test from David McCandless. Also check out these other two examples that were comissioned by Wired Magazine: Complete Workup, PSA. Beautiful and the reader can take action off of them. The downside is that these designers don’t work in the medical field and definitely do not work for an HIT vendor. They came up with these by consulting with two people from Dartmouth Medical School Institute for Health Policy and Clinical Practice. Let’s redesign how we communicate medical information to the patient. Kaiser-Permanente is already sending out normal lab results electronically to patients and everyone loves it even though it’s not perfect. The patients know what action they need to take given their normal results: none at all. Sunny and 80 all day. We need to deliver bad news in an actionable format as well. We also need to redesign the information for providers. From a design perspective, electronic record systems are notoriously bad about presenting information. A few have a limited number of meaningful visualizations in almost exclusively the standard graph form, but all of them present raw data just like it was on paper that’s immobile and unactionable. Of the 100s of providers I’ve talked to over the years, they all strongly state that they want to have a snapshot view of their patients. Not a “drill down here, drill down there” view of their patients. They want a single-screen telling them the current health status of the patient, what medical problems that patient is facing, what treatment plans have been given to the patient and how compliant that patient is about following those plans. Instead, they get a dam break of raw data that they have to spend time sifting through and drilling in to. Finally, when the crunch is on, they give up and ask the patient something that is already in their chart…somewhere. Unfortunately, there doesn’t seem to be a whole lot of work going on in this area. Microsoft has the coolest thing going on with their Common User Interface, but even that is lacking. Is no one mingling different points of data (i.e. medication dosages with lab results, symptoms matched with diseases) and bringing them together visually with context? It was mentioned in the book, The Innovator’s Prescription by Clayton Christensen that what we term diseases today may in actuality be symptoms of the real underlying genetic or other deeper medical problems. We need patterns to figure this out. The human brain needs patterns to identify in order to anaylze, interpret and discover. The eye is a human’s greatest sensory organ to recognize patterns because it can handle more information at once than our other organs, but do we have to make it work so hard? Medical research and treatment goes nowhere without recognizing patterns. How many pre-diabetic people understand that they’ll most likely end up hypertensive if they live in Wheeling, WV (Pretty much anywhere else too)? They could if they looked at my basic visualization of patient diagnoses. The visualization even needs a ton of work to be considered a good design such as identifying what the ICD-9 codes stand for and what symptoms usually arise from those disease, but even in its novice state it gets the point across. As much as I loathe the poor design going into electronic medical records these days, I do have faith that the quality and speed of input of information into these systems will improve. The HITECH Act’s Meaningful Use is actually encouraging this in its own way. But that’s half of their purpose. We need to remember to that information needs to be meaningfully designed and communicated for action and not displayed in a way that fits what we can on the screen. If we did this, our usage of these systems in healthcare would be a whole lot more…well, meaningful and our communication would be too. *Not my actual lab results. I’m healthy, no need to worry!